After fashion shows it is quite often that I will come home and long for a hot bath, unfortunately we don’t have a bath in our flat… so foot soaks are the way forward for me ( they also take much less time and cleaning!). This is a very easy DIY foot soak to relax tired feet, perfect at the end of one of those busy days when your feet are in need of a little TLC. This salt foot bath is not only relaxing, soothing and super softening but the health benefits of Epsom Salts are IMMENSE!! Most of us are deficient in magnesium, so soaking your feet in Epsom salts is an easy (and enjoyable) way to get a boost! 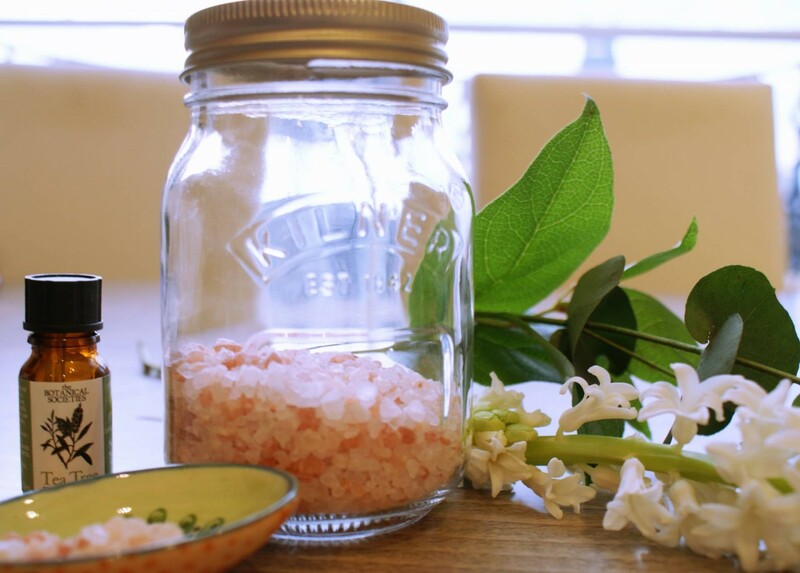 When added to warm water, the health benefits of Epsom salts are absorbed through your skin. Magnesium is an essential mineral, especially for women, that depletes rapidly in the presence of stress/alcohol/sugar. It can lift mood, tackle depression, soothe muscle cramps & PMS and calm anxiety. An after effect is it also aids sleep as it helps to calm your nervous system. Mix half a cup of Epsom salts with warm water in your foot tub and soak for a minimum of 20 minutes, you can add ingredients to tailor the soak to your mood/needs. This will help to relieve muscle pain and stiffness, soften the skin and also neutralizes any foot odours. Lavender Oil: a drop or two of lavender oil is very healing and will calm muscular aches and pains. This is especially helpful to use near bed time as lavender can aid sleep. Tea Tree Oil: a drop or two of tea tree is antiseptic and anti-fungal. It can be used to treat athletes foot and combat odour causing bacteria. Oats: a teaspoon of oats are perfect for the gentle treating of dry and irritated skin. A teaspoon of baking soda can also be added to help with detoxification and soften your skin. Why not experiment with other essential oils and see how they affect your mood? Once you have a personal blend you love, make a batch to keep in jar to save time in the future. Make a cuppa (or a pour a glass of vino if you’re like me), pop your favourite show on and relax! (If you are pregnant or have health concerns please check with your doctor before using Epsom salts & essential oils). How about lemon extract in hot water.